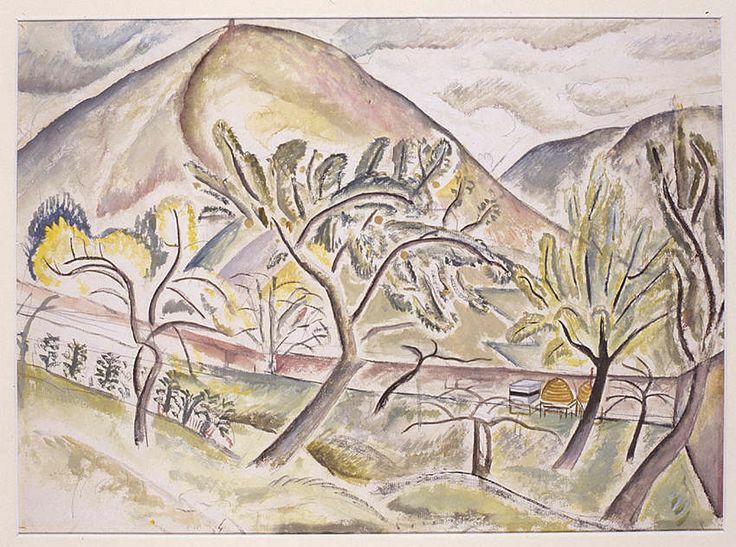 The extraordinary David Jones is impossible to pigeonhole, and perhaps – despite being judged one of the major figures in 20C literature by T.S. Eliot and W.H. Auden, no less – that’s why he remains so little known. But already I have pigeonholed him. He was also a powerful and original painter, with an all-embracing vision. My own discovery of David Jones is only just beginning, and follows an inspired tip-off. Earlier this year I mentioned to a friend a new anthem I’d been commissioned to write for St John’s College Choir. I was impatient to get started, but couldn’t find a text that I wanted to set. With an instrumental work, if you want to get started, you get started – or at least you try. But a vocal piece like this there’s little point in sketching if you have absolutely no idea what the text will be; without it, you can go nowhere. I was delighted when the friend sent me a photocopy of a single page from Jones’ long, unfinished and wonderfully strange poem The Sleeping Lord. And it was brilliant of her to send me that particular page, too. If by chance I had found the poem myself, I would certainly have found it fascinating and unusual, but would quickly have dismissed any idea of setting it – certainly for this anthem. However, the passage singled out for me, while absolutely typical of the ruminating, deep-digging, long-ranging quest pursued across the poem’s 30+ pages, also encapsulates it in something that has the jewel-like precision and crystalline form of a sonnet. At the root of this poem is the idea of Christ as somehow dwelling in the modern landscape, indeed, being the landscape, bodily – with all its scars as well as its beauty. If you’ve read a little of the poem and have felt the way Jones identifies body and land contours so vividly, it’s almost impossible to view the picture above without seeing the same vision, though it was painted decades before the poem. This was excitingly vivid, thought-provoking and unusual imagery to work with, and from then on writing the anthem was a great pleasure. I look forward very much to hearing the first performance from the magnificent choir of St John’s conducted by Andrew Nethsingha, next year. Virginia Woolf & Music is a fascinating series of concerts and discussions exploring the rich relationship between Woolf’s writing and thinking, and her experience of music and musicians. I was delighted to be asked to write a short setting of some of Woolf’s words for voice and piano, to be premiered during the 26th Annual Conference on Virginia Woolf in June 2016. Setting prose to music is a strikingly different experience from setting lyric verse. Perhaps some of Woolf’s more ‘musical’ passages, such as the poetic and lyrical refrains of The Waves, might have lent themselves more immediately to this kind of treatment – but I didn’t want to tear a short passage out of an intricately interwoven progression that spans the entire book. Woolf’s Diaries and Letters were suggested to me as good places to look – and certainly, they are bursting with life and quick sharp perceptions. But in the end I settled on a passage from an essay, ‘Street Haunting: A London Adventure’. How beautiful a London street is in winter, with its islands of light, and its long groves of darkness, and on one side of it perhaps some tree-sprinkled, grass-grown space where night is folding herself to sleep naturally and, as one passes the iron railing, one hears those little cracklings and stirrings of leaf and twig which seem to suppose the silence of fields all round them, an owl hooting, and far away the rattle of a train in the valley. A deeply evocative scene, in which we both do and do not stay – for Woolf’s imagination is quick to burrow behind the vivid and immediate sights and scents and take us on unexpected journeys, even if in the end she checks herself, and asks to ‘be content with surfaces only’. I tried to keep my setting clear and unfussy, so that rich and complex sentences can still be understood, and words are given space to resonate. And I tried to make musical clarity and unfussiness leave space for mystery, suggestion, the unspoken and the half-thought. A London street in winter will be given its first performance by Annelies van Hijfte and Lana Bode at 7.30 in the Clothworkers’ Centenary Concert Hall, Leeds University on Friday 17 June. The actual music followed fairly quickly and without too much struggle. I was keen to explore the extreme delicacy and fragility of an orchid, as well as the heady scent and langorous curves. The cello is an instrument of almost unlimited range, in terms of notes, of intensity or loudness and softness, of texture and timbre… So it was fun to write, and I soon found that 8 cellos is enough to do almost anything – it does feel a bit like writing for an orchestra. Cellophony play at the Cambridge Summer Festival on 1 August at 3.00pm. Stephen Romer’s poem Collects for Lent is an intense and searching meditation. Images of wintry rivers, grey seas, monastic ritual, birds and signs of the year’s natural cycle are sketched in tiny phrases that are as pithy and dense as they are simple, and drawn together in a chronicle of pondering, mourning, endurance, ending with a glimpse of possible rebirth. Setting these words to music was a wholly positive experience; despite the darkness of the text and the suffering from which it springs, I found it a source of energy, direction and clarity. The full score was completed and sent off to the performers – the French vocal group Vox’Sing, together with two fine instrumentalists from the Tours Conservatoire – at the end of January. Both Stephen and I coached them in the pronunciation and the poetic import of the words, and after an intense period of rehearsal they gave a wonderful first performance in a beautiful restored Grange in the countryside outside Tours. In an earlier concert violinist Liza Kerob played In a quiet room with a poise and depth of feeling that was very moving. I am sure these will prove to be the first of many happy collaborations. I’d like to thank readers for their patience; these posts become very intermittent between January 2015 and May 2016 (because of health difficulties with my eyes during this period). I am retrospectively adding a couple more posts (backdated) to document some of what I composed during that time, and aim to resume normal service from June 2016.